Horn flies can cause big problems for cattle and cattle producers. The biting insects feed on the blood of cattle, 20 to 30 times per day. The biggest problem with these flies is when they reach a point of almost overwhelming numbers and cattle are forced to expend high levels of energy to fend them off. In addition, feeding and grazing patterns are also negatively affected, resulting in significant weight loss and poor cattle development. Published reports put the economic impact of the horn fly problem at over $875 million per year. Poor reproductive performance and calf development are two of the major issues. Studies show horn fly infestations can reduce weaning weights by as much as 25 pounds, reduce growth rates in replacement heifers by up to 14% and reduce daily gains in yearlings and stockers by 0.2 pounds per day. In addition, horn fly control programs can cost producers thousands of dollars a year. Low moisture blocks from New Generation Supplements fortified with Altosid®, offer the most effective and convenient way to control horn flies in beef and dairy cattle. 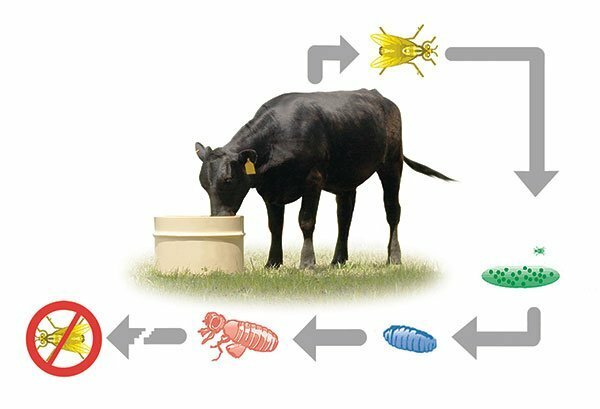 Altosid helps reduce horn fly populations by breaking the life cycle of the fly, preventing the development of biting adult flies. By providing IGR fortified New Generation Supplements products producers can effectively stop the cycle of horn flies and help improve the performance of their cattle. As an insect growth regulator, Altosid passes through cattle and into the manure. This is where the breaking of the fly cycle begins. Female flies lay eggs in fresh manure. Within a week or so the eggs develop into larvae, then pupae and then adult flies. The active ingredient in Altosid, methoprene, ultimately prevents fly eggs from completing this cycle, keeping adult flies from emerging. 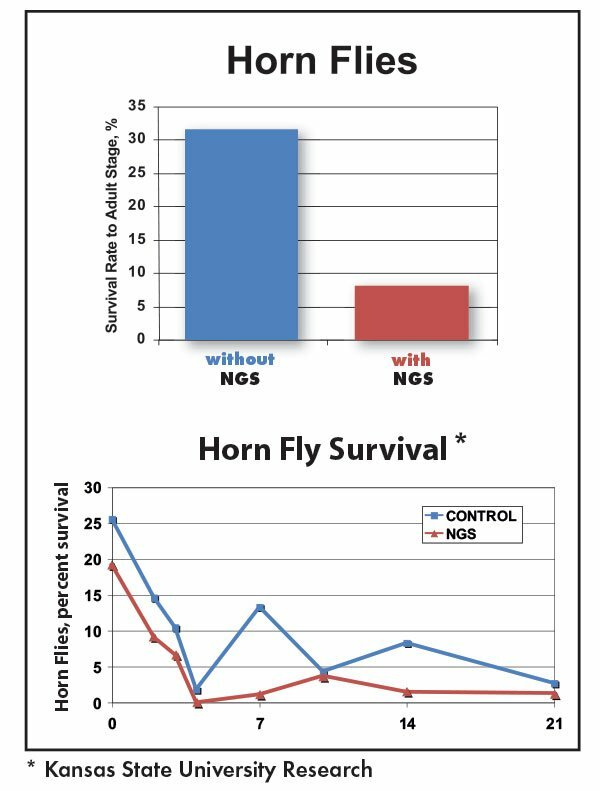 Kansas State University research shows that feeding New Generation Supplements IGR blocks fortified with Altosid to cattle significantly decreases the survival rate of horn flies to the adult stage. New Generation Supplements is the only block manufacturer to have its own fly control research. IGR low moisture blocks from New Generation Supplements contain 0.005% and 0.01% of the active ingredient methoprene respectively. When fed properly these supplements will provide a sufficient amount of insect growth regulating methoprene to prevent the emergence of adult horn flies from the manure of treated cattle. Existing adult horn flies will not be affected.